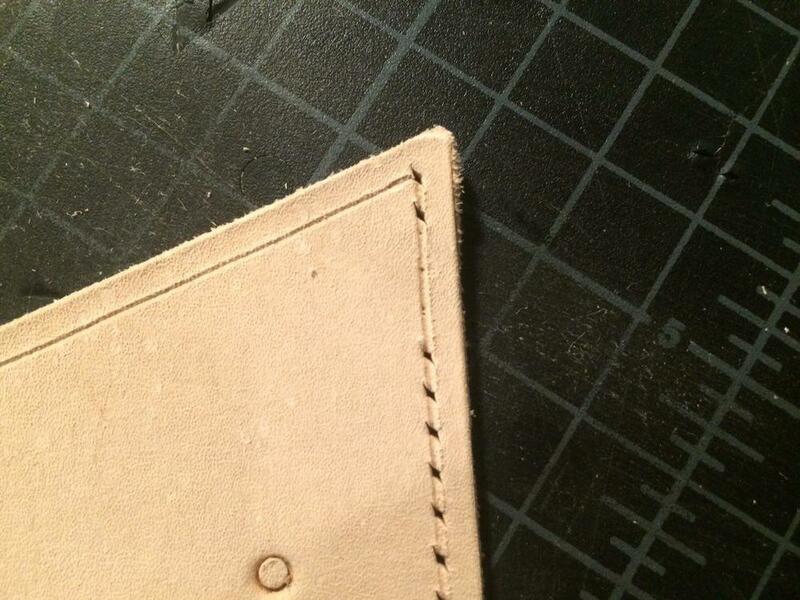 I’ve mentioned this before, but using diamond chisels will make a huge difference in your stitching early on. They create consistent, accurate, and evenly spaced/sized holes. 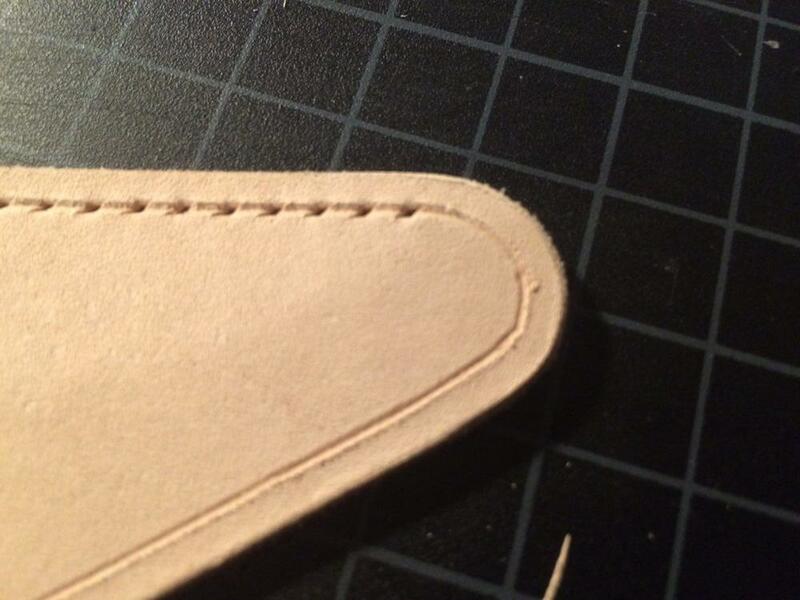 When learning, this is great because it puts all the attention on your stitching, not the holes. If you’re not happy with your how your stitching looks after using a chisel, you know it has something to do with the way you’re stitching and you can focus in on that. When trying both at the same time, it’s hard to know what is at fault because there are too many variables. And even though diamond chisels make such great stitching lines, there are still are few circumstances where it is easy to mess them up. Unfortunately, with the great accuracy chisels offer, when you make these mistakes they stick out pretty noticeably, so here are a few tips to make sure your entire stitching line looks perfect. 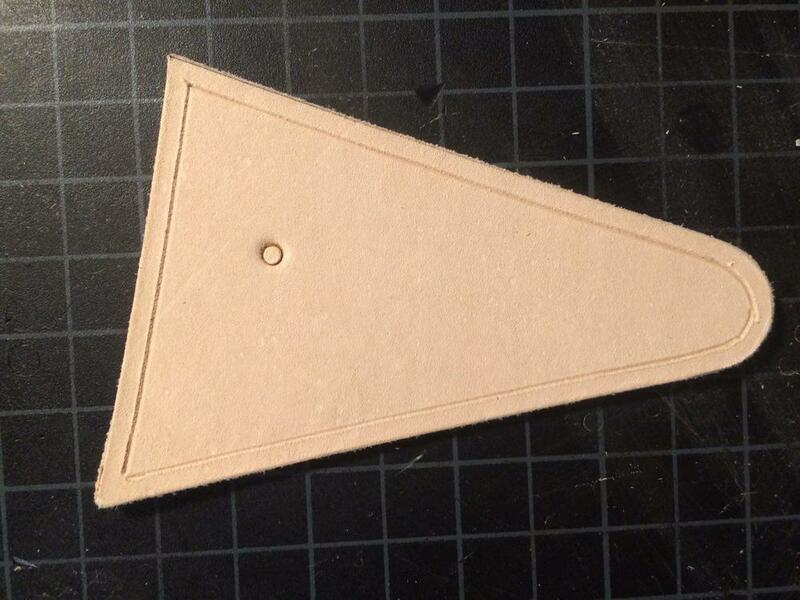 I'll use this piece of scrap leather, that I've already created a stitching channel on, to help explain these three problems. The most common places you will run into a problem is when starting your stitching line, creating holes approaching a sharp corner, and creating holes when going around a curve. Generally, knowing where to start your stitching line is pretty simple. 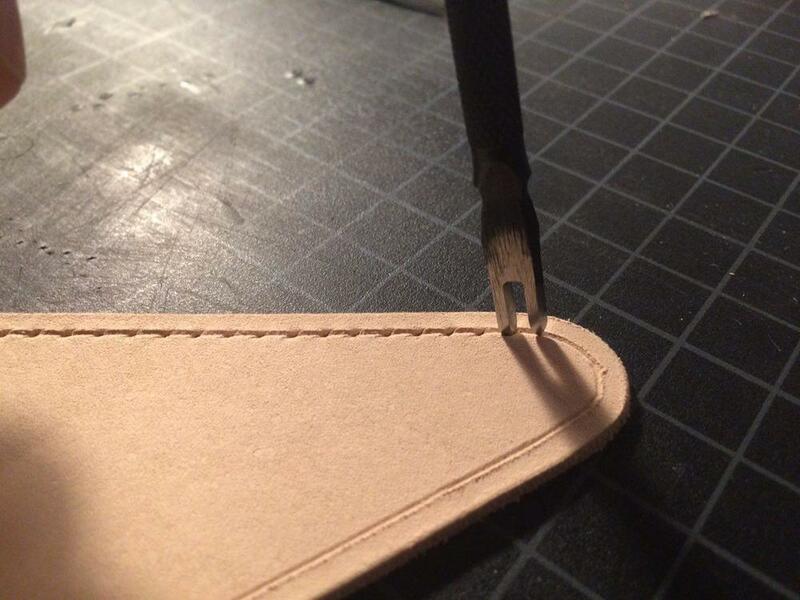 In some projects however, you want the stitching to go over the edge to prevent two pieces of leather from coming apart at a seam. Sometimes you can start the stitch too far away from the edge or too close, creating an uniform look when compared to the rest of the stitching. To fix this problem, you need to find where to place the first hole. To do this, set the diamond chisel in the channel you’ve already created with your groover, leaving the last tooth on the chisel just over the edge. Notice where the second tooth rests in the channel, now move the first tooth to this point. You've found your starting point. You always want the the stitching hole to rest in the corner of a 90 degree turn. If you do not do this, your thread will not follow the shape of your edges. But sometimes, when approaching a corner you realize that the natural spacing of your chisel is not going to create a hole that sits in that corner. So you have to adjust the spacing while still making it look natural. To do this, punch within three or four holes of the corner and then punch a hole at the corner. Using chisels with different amount of teeth, find out how many holes is too many. Then using a chisel with only one tooth, evenly space out the number of holes that is one less than what you decided was too many (i.e. if four was too many, create three holes) between the last hole you made and the hole at the corner. Punch holes along your stitching line until your chisel no longer rest within the stitching groove as you approach the curve. At this point, switch to a chisel with only two teeth. 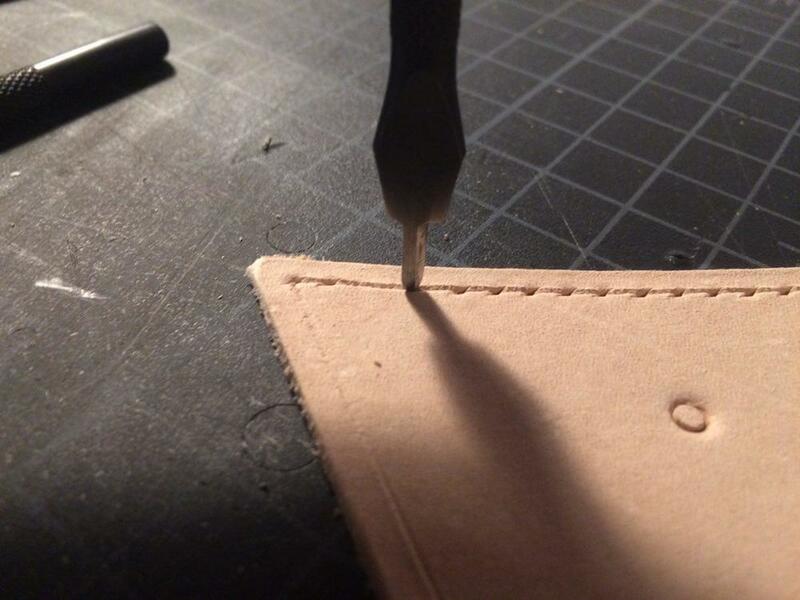 Setting one tooth in the last stitching hole you made, place the stitching groove as it follows the curve of the edge. Instead of using a hammer to create a hole at this point, press down to leave only an impression. Continue this process until you’ve go all the way around the edge. Then go back and create the hole using a chisel with only one tooth, keeping the top and the bottom of the diamond shape in line with the edges of the groove. Sometimes I notice that the front of my stitching looks angled, just like it should be, but the back side looks flat, like a machine stitch. And if I'm going to spend all that time hand stitching, I want people to know. One cause of this can be the way that you are using your chisel. Often times I will fail to punch my chisel far enough through the leather. If you take a look at your chisel you can see where the blade of the chisel gradually turns into the diamond shape. It is not until that diamond shape is past the other side of the leather that the hole has been properly created. If you don’t push the chisel far enough through, the holes will look more like slits and less like diamonds. You can see the difference in the picture. Working around curves, approaching a corner well, punching your chisel all the way through the leather, and starting your stitching lines right, should all go a long way in improving the overall look of your stitching lines. As always, I’m still learning and I know there are many other tips out there for making your stitching even better. If you have your own tip and want to help everyone who is part of this community get better, I invite you to put it in the comments below. I’d really love to hear from you.